The FRA-DIE-09412 Stars Card Panel die makes this great background. Not only do you get this fun background that's perfect for so many themes, but you also get the mini stars that cut out of it. How awesome is that?? 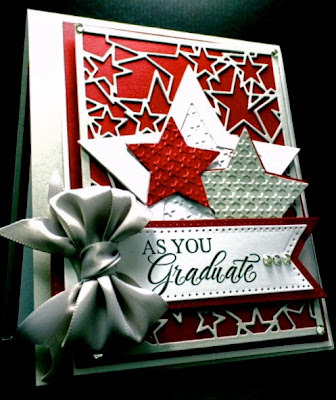 The front stars on the card were cut with Spellbinders Dies and given texture with the Mini Stars Cuttlebug embossing folders then layered for dimension. The sentiment Panel was cut with the CE Pierced Flags Die by Sue Wilson, found here. You'll LOVE the Creative Expressions dies!!! Thanks for stopping by today. I love hearing from you and hope to have inspired you! Hi America what a wonderful card I love the colours and your design is wonderful. This is STUNNING! Layered loveliness. Thank you so much for sharing your very beautiful art with us this week at Word Art Wednesday on our 184th AGFF Challenge. This is gorgeous America! Love these stars and what wonderful textures. Love this America! That background is on my wishlist and now I'm kicking myself for not getting it sooner. Thanks for the inspiration! Well, first let me say that your card is absolutely STUNNING! I love everything about it from the die-cuts to the amazing bow you've added. It's just lovely, and I cannot thank you enough for stopping by to share it in our challenge this week. I'm SO honored to have you link up with us, and I really hope that you will join us again soon. I am just smitten with your amazing art work. Your card is a show stopper. I wish I was getting this card!!!!! Thank you for creating with us this week at Little Red Wagon Challenge Blog. Beautiful card! Perfect for graduation. Thanks for joining KKS wonderful Wednesday challenge! BEAUTIFUL graduation card! Gorgeous design! Wow, I love all the texture in this! We’re moving on Wednesday! I hope you’ve had a chance to visit the new blog and become a follower. If you haven’t had a chance yet, remember, it is a requirement to claim prizes at IDCB. If you have, thank you so much for your support and thanks for sharing and joining us at Inspiration Destination Challenge Blog. Hope to see you again and good luck! I'm SO glad you stopped by to share in our Red, White and Blue Challenge. I absolutely LOVE this wonderful project. You are SO talented. A really striking card - love all the stars and that ribbon looks great. Stunning card!!! Love everything about it! Thanks for joining us at Penny's Paper-Crafty Challenge this week! Beautiful card! Thanks so much for participating in our Really Reasonable Ribbon Challenge. WOW! This is a stunner! I super love the ribbon and the gorgeous bow! Your layers are fabulous! Thanks so much for sharing it with us at Really Reasonable Ribbon!